In 2013, the PBS Newshour did a piece entitled “California Activists Want Smart Meters Banned, Claim They’re Bad for Health.” SkyVision Solutions reviewed the PBS video and found it to be a good example of smart grid misinformation, propaganda, spin, and dogma. Below is an edited version of an excerpt from the PBS video with appropriate commentary provided through the use of captions. 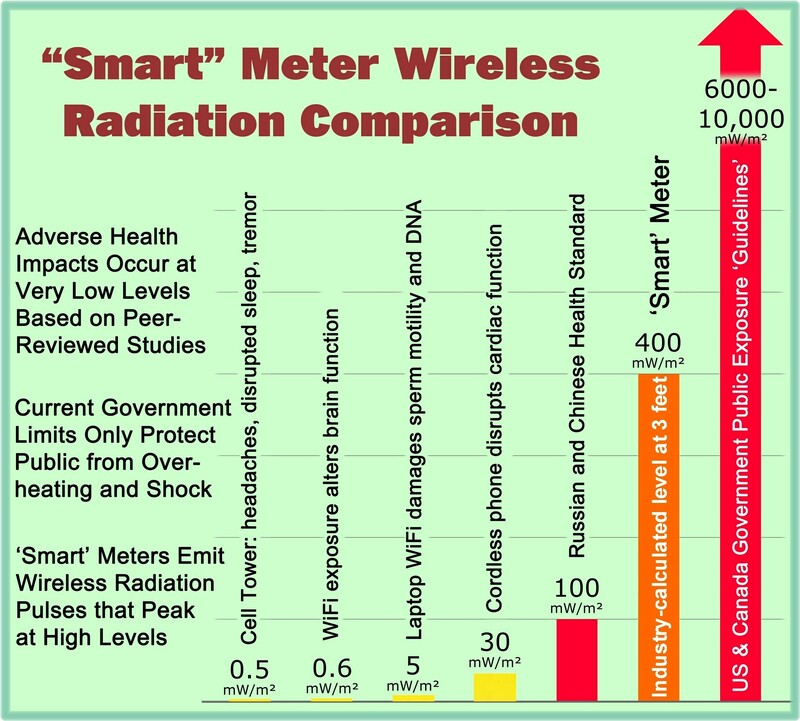 The report released by the California Council on Science and Technology (CCST) in 2011, entitled, “Health Impacts of Radiofrequency from Smart Meters,” is often parroted by other smart grid-related organizations. In fact, the CCST report drew most of its information from Electric Power Research Institute (EPRI) documentation. We thus have an endless chain of self-reinforcing dogma which reflects little concern for public health and welfare. The CCST report even contained a statement which inferred a considerable degree of scientific bias where it stated that the CCST review team “privileged those studies” that contained a “finding [that] is generally accepted by a relevant scientific community.” Who is “relevant”? Essentially whomever the CCST review team deemed appropriate. By design, this criterion made it impossible for emerging scientific studies to influence the final conclusions of the report. Also, why limit the scope of review to scientific information on an issue such as health where the “medical community” may have significant “relevant” input? One can only conclude that the above quotation perfectly fits the context of what the California Public Utilities Commission wanted from the CCST back in 2011. This entry was posted in Smart Grid, Smart Meters, and RF Emissions and tagged California, Health Effects, Propaganda, RF Emissions, Smart Grid, Smart Meters. Bookmark the permalink. We are fighting Agenda 21 and surveillance towers here in Lynchburg and need some legal help with countering the rules dictated by Agenda 21 to deny public discussion and debate at City Council where we were informed by the City Council attorney on the bench that we have no rights to deny tower construction anywhere, for any reason, due to the Telecommunications Act of 1996. However, according to Larry Klayman (who hasn’t answered), Judge Leon has declared surveillance towers and government snooping unconstitutional. NSA and Obama are appealing. We need help. If anyone knows a qualified lawyer, we would like to contact hin or her. Thanks. I suppose a question would be whether it is really a surveillance tower or a cell tower for which the City has agreed to be placed within the City in return for money, i.e., for purposes of City revenue. Sometimes such towers are even built near schools and followers of this website generally think such action is totally irresponsible and potentially harmful to school children. I am no lawyer but acknowledge that citizens currently don’t have many rights when it comes to dealing with the FCC (and Telecommunications Act). Sometimes public uproar can convince telecommunications carriers to build elsewhere. In addition, if the City is inviting the tower into the City, pressure applied to the City Council might make them change their mind. But possibly not enough people speak up or are aware of the issues.